I've been using SAL for about a month and I have some questions about it. I ordered a item on Nov. 12 and it arrived today, on Dec. 5. But the items that I ordered on Nov. 4 and Nov. 7 didn't arrive yet. Is this usual? or are my items missing? Also, since SAL doesn't have a tracking number, how should I ask the USPS if they have my packages? If any of you have similar happenings as me, please help. Not that unusual for packages to arrive in a different order to that in which they were sent. I'd give it a few days, I've never lost any of the countless packages I've had from Japan. Yup, it happens. I had a 2nd HS order arrived already while the first one hasnt arrived yet. They were ordered a week apart. SAL only gets available space on planes. This can cause delays at busy times. One Japanese dealer lists SAL as 14 to 56 days delivery time. Thank you ^.^~ I feel much better and I think I'll give it another week to come!! Over a decade of hundreds of sal packages here to the dc area it's been a range of 1-4 weeks, but I'd say 95% were within a couple of days of 2 weeks. I use EMS because usually it takes 10-15 days... (2-3 days from Japan to Italy... then 5-10 days for custom reasons, then 2-3 days for delivery). Unlikely in Italy our mail system is a snail... When you claim the answer is "it's aproblem of custom"... No good! I ordered some items from HS and they shipped on the 4th, and they're out for delivery today on the 7th, but I used EMS this time. All other shipping methods we currently offer such as EMS, Air Small Packet, Unregistered SAL Small Packet, and SAL Parcel will not be affected and will continue to be available. didn't even know it was available in australia. a lot of vendors do not do registered sal, its a bit of paperwork and an extra cost they just dont want to spend time on. if you want tracking they usually just push you to ems. it does bring 6000 yen insurance with it (along with tracking) for the 410yen cost. i just noticed something on sal that the shipper can get bulk discounts on sal shipping, so i wonder if some of the odd little delays that happen with it might be the shop or shipping agent holding onto packages until they have enough to get the 10 or 20% discount? actually in the last decade i have only lost one package at all in the mail and that was w/in the us, bunch of japanese magazines where the package exploded along the way. it was reported and months later the bit of package with the label got to me, but alas in that sort of situation the magazines were probably shredded on a conveyer somewhere and toast. I have just checked about registered SAL thing by calling Japan Post. They told me that there will be no change in countries where registered SAL is available even after 2014. The announcement was issued very before the go-live date. It is really surprising. Now the news release is up at Japan Post after I called Japan Post for this issue. Registered SAL to above countries will no longer available. It takes longer and things are about to shut down for the Winter holiday. Hobby Search orders must be paid by 6am December 26th. Then HS is closed December 30-January 4th. Order processing resumes on January 5, 2017. A few of my recent Hobby Search shipments made an appearance in Sydney yesterday or today, one went for a customs examination too. Most of them were sent out in November, I'd other items from them sent to me around the same time beat it here. Customs I'm sure plays a roll in the speed. Ive never had a package opened by Costoms here but a few EMS packages that seemed to be taking their time tracking showed the extra time was the package sitting in Costoms here in the us. Postal services are kind of the twilight zone. Luckily overall I have great luck with stuff from all over the world here. Glad the packages showed up! 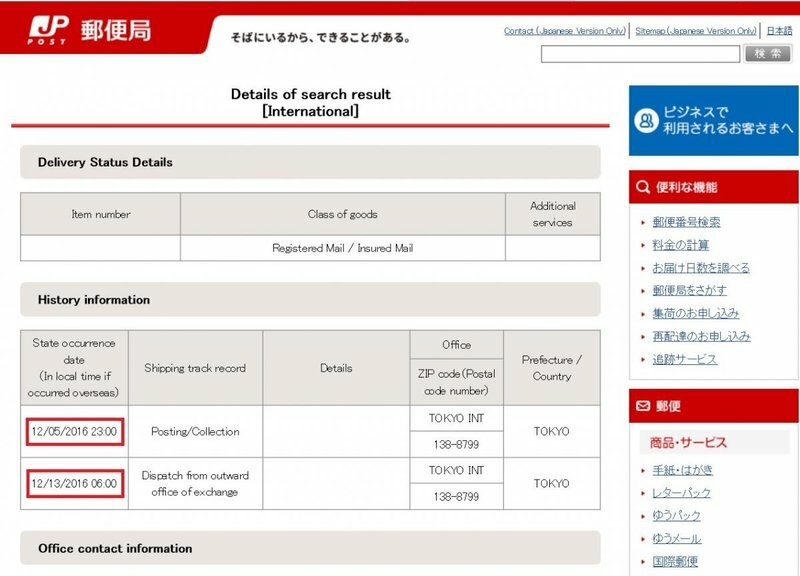 According to the Japan Post tracking page they're supposed to be delivered today, however unlike previous times the Australia Post tracking page has no record of them. So I'm just presuming that they made it to the local processing centre & then to the depot for end delivery with no issues. As some of our parcel thieves decided following the delivery vehicle, so they could hijack it, was too much effort & instead raid the depot. I'm waiting on a package that was shipped on November 14. I think it must be on a slow boat going around Cape Horn. This is the longest wait I've had for a SAL package. The main one I was waiting on from Hobby Search, departed the day after yours. I received a bunch of parcels today with a mix of November & December shipping dates and almost countries as a non-train one from the Seatle area turned up too. My suspicions on why one was pulled for a customs check was the packing paper inside had a faint odor of something, so the dog must've tripped on it. I am also waiting for a SAL package shipped mid November, according to tracking it is still sitting in Tokyo. This is also the longest I have had to wait foe a SAL shipment. That's why I avoid SAL shipping now. SAL only gets available space on planes and if the number of flights is down (as it was after 2010) and the volume is up it sits. My experience is that it will sit again once it gets to Vancouver. My experience has been 5-6 weeks without any peak loads and Winter holidays in Japan. I did have one Registered Air Small Packet parcel from a Rakuten dealer arrive almost as fast as EMS when it was shipped in late November. It might be the way to go. Agreed. I just received a registered air packet from ModelTrainPlus which arrived almost as quickly as an EMS. This is inspite of the Xmas rush. Had one sent 23rd December small packet SAL, and got it in a week and a half.